What is a good sailing school? I would say, it´s a place where you won´t just be taught how to pass an exam or how to get a certain certificate, but where you can gain skills both in sailing abilities as well as in seamanship. It certainly depends on the skipper you´ll get: And I can say that I again was so lucky with my skipper during the SKS (equivalent to the RYA Coastal Skipper) a few weeks ago. (You may read the practical sailing education here and the examination day here). Dietmar, his name, told us right from the beginning what his intentions have been: Teaching us how to sail and how to act as a thorough skipper. And yes, there´s an exam we want to pass. But that was his smallest concern. He wanted to teach us stress-free sailing without yelling or bitching, instead, how to sail in a calm, confident and safe manner. 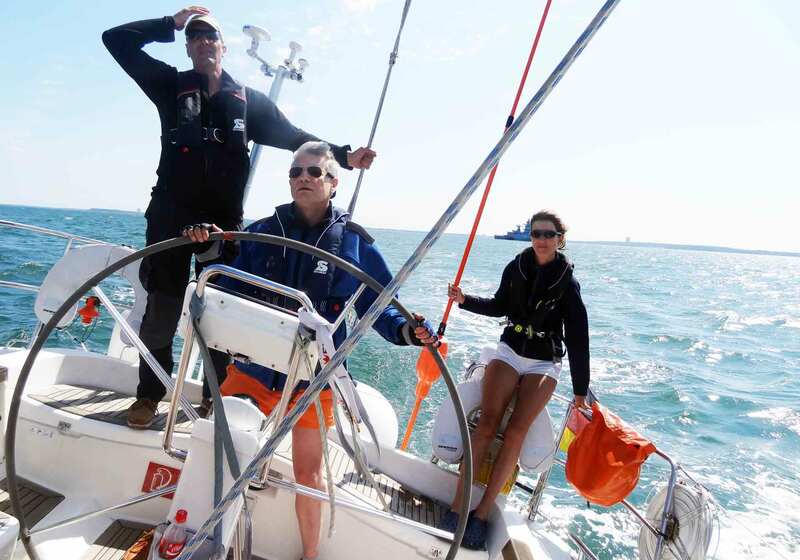 Here are the four big learning I gained during this 6-day sailing school-cruise on an X-442 yacht: The best marina berthing maneuver ever, casting off stress-free, a very quick Figure-8 alternative and last not least the most simplistic last minute maneuver. The best thing: It is possible to do all these maneuvers single-handed. 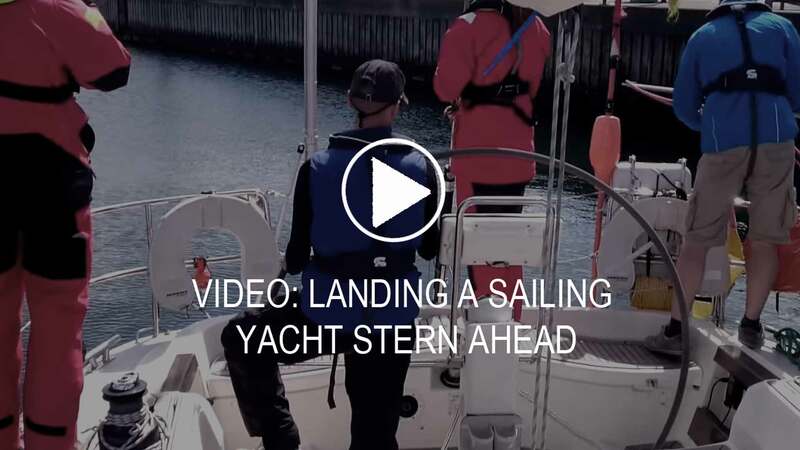 We all know the classic landing when it comes to go alongside a pier: Taking aim with the bow, reducing speed as much as we can, move slowly alongside and reverse gear to stop the boat. Now the stress comes into play, because somebody (mostly the wife of the skipper or – worse – an uneducated guest) has to jump to the jetty to head off the boat with a rope. Oh dear, that´s load, there´s a lot of yelling and – perish the thought! – what if wind blows from the “wrong” direction? Landing Stern Ahead – precisely steam reversing. Here´s the problem: Anchor, Bow and pulpit will be put dangerously close to the pier. There´s a whole variety of possible damages lurking. Another problem is, that the skipper will have to be very, very precise at helm and throttle. Which is not a problem for somebody knowing his ship inside out. But who does? When wind blows, drifting will have to be taken into consideration. Last but not least, the view from helming station at the stern to the bow is restricted and often obstructed. If the berthing space is too narrow, a safe landing won´t be possible. Not the best premises, aren´t they? Well, here´s the solution: You just have to reverse gear. Landing stern ahead is fast, convenient, safe and absolutely stress-free. Step 1 and Step 2: Putting over the Rope and a short push ahead. You will steer the yacht in reversing right in front of the harbor entrance. That means go into reverse gear before entering the marina. This is by putting her stern into the wind, full throttle reverse to gain momentum and then like a van or a car – steaming through the jetties stern ahead. Don´t panic: The ship is just perfect at the rudder. It´s just that you never have had experienced her behaving that way. If you have enough incoming flow to the rudder (1 knot will do) she will obey your helming decisions like if she would go forward. You will instantly notice: Perfect view, no obstructions. When steaming through the jetties, your wife or guests may ready the fenders at the very ship´s side you are going to put along the pier. Best thing: You will need just one single rope. No, believe me: Just one single rope! This one rope is the stern rope. You will prepare a knuckle, depending on your ship this knuckle should at least measure 2.50 meters. Now put the knuckle onto the boat hook and be ready. Either you or one of your guests will later put this knuckle over a bollard or clamp. That´s basically it. 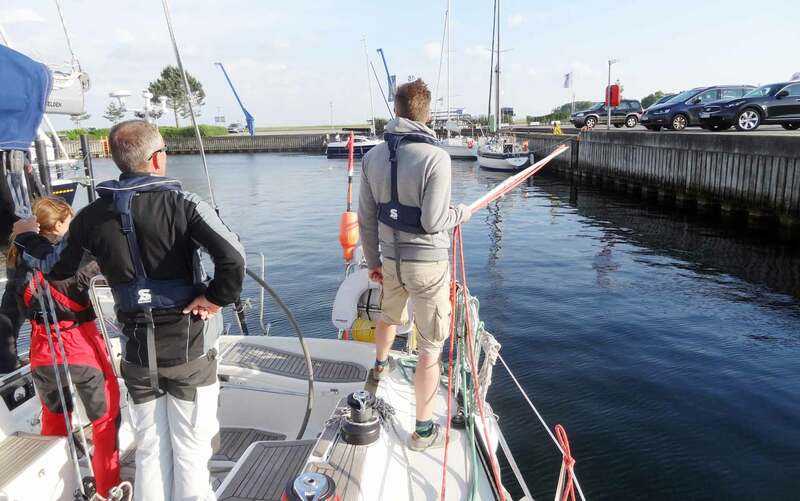 If you have the bollard in sight where you want to land the boat, bring the ship slowly to that point by steering the pier-side stern right towards the bollard, try to achieve an angle of 25 to 45 degrees (depends on the wind). Do it slowly. Slow! Don´t forget to have a large ball-fender right at the stern. When you have half to one boat length to the pier left, put engine in neutral, then slow ahead. Let the boat drift towards the bollard, ready at boat-hook! Give one or two short pushes flank ahead to bring her to a stop shortly before the pier side. You will notice that you will be able to stop the boat just centimeters away from the pier – it´s easy. If she is stopped, you´ll have some seconds to have the knuckle be put over the bollard. When rope is over the bollard, slow ahead and rudder to pier side. Now magic happens: The boat will align herself to the pier side slowly. If she´s parallel to the pier, full helm to pierside and engine still running: The boat will be pushed against the pier side and thus be landed stable. And that´s it. Landing stern ahead with just one rope. You have now all the time in the world to have the rest of the ropes applied accordingly – engine still running holding the ship tight to the pier. These are the advantages of the maneuver: First of all, it´s totally stress free. Just you at the helm with a splendid view and only one single rope. No jumping to the jetty, no yelling, no hectic. You have a perfect view over the stern, distances are very easily assessable. This maneuver can be done single handed. 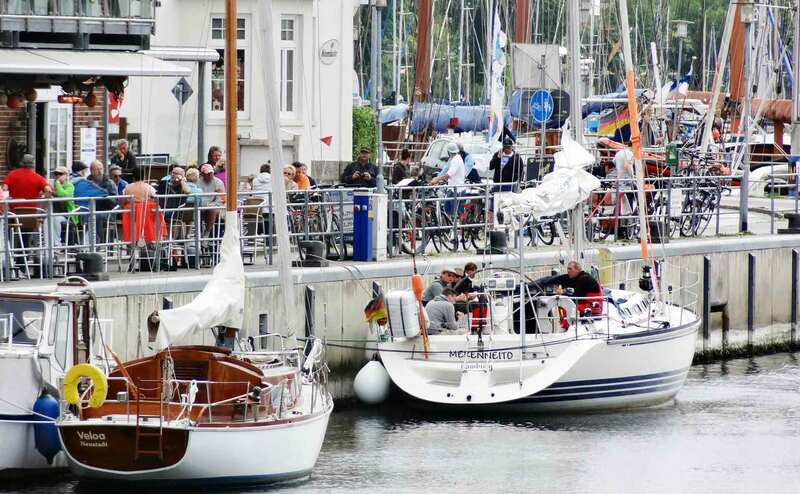 The best: You can land the boat even into very narrow berths alongside a pier where forward would´nt be possible at all. I would say it´s a perfect maneuver for small or inexpert crews. You won´t have to employ a whole armada of people to bring the ship to a standstill. It´s stress free, elegant and perfect for showing off. Landing stern ahead can be done in every wind situation, no matter from where it will blow. By putting the boat in a stable condition with the engine and holding her in position you may take any time you want to apply all ropes and springs ropes. Caution tiller-steering: Reversing puts enormous forced onto the rudder so you ought to hold very, very tight to the tiller to avoid rudder-damage. Nevertheless, it´s a perfectly beautiful maneuver. Think of it: I have never had the responsibility for a 44 feet yacht – and I was able to safely land her in a matter of 3 or 4 practicing rounds. As well as it is the case for landing, the classic procedure for casting off when alongside a pier is inching into the spring. Of course, you may give the boat a push or just let her drifting away, but there is a much more elegant and convenient way to cast off. Problem with standard maneuver: Pulpit, anchor or bowsprit could again hit the pier when the stern will be going away from the pier side first. Again, there´s low visibility from stern to bow and not less skippers miscalculated the moment to let loose the spring rope and steam away. If you are sailing alone, the crucial last rope to be put off is at the most remote place from the helm, where you will have to be steering and controlling the engine. Solution: Let physics do it´s job. We will be casting off like magic (again) with a seaward stern rope. This will enable us to start the cruise bow first, avoid reversing and cast off fast and neat. Still moored, you will apply a rope as a knuckle over a bollard and have it directed to the seaward middle clamp. Start the engine and – again – hard rudder to pier side to push the ship steady to the pier. Now take in all ropes except the seaward and the stern rope. Set engine to neutral for a second, strain on the ropes will ease, take in stern rope. Engine to slow ahead again. Now the boat will slowly bear away from the pier side. Again don´t forget to have a large ball fender at the stern. You may control speed of the maneuver by putting helm midship or have more throttle applied. If the angle to pier side is enough (again, depending on the local situation and winds) set engine to neutral, easing strain on the seaward rope and take in the seaward rope fast. Flank ahead and off you are. Let her bear away, then haul in the Rope and off we are. The advantages: This is casting off with a guaranteed success. You will be able to perform this maneuver in any circumstances no matter from where wind will be blowing. 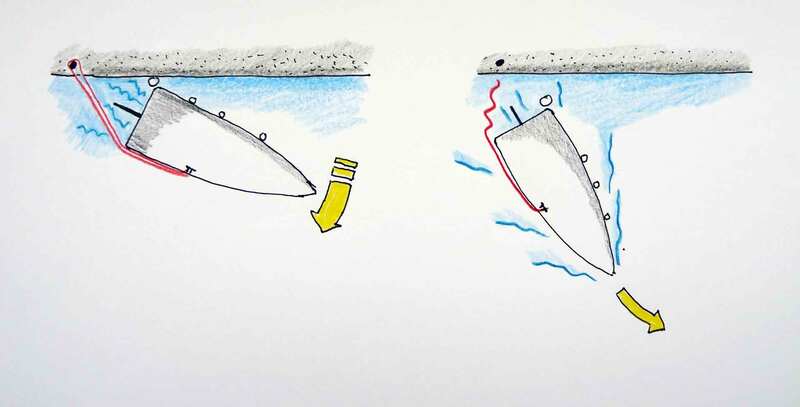 You can cast off bow first, adding safety because you have flow at the rudder from the screw at any time. That´s different when casting off stern first. Again, this maneuver could be done single handed (if the clamp for the seaward stern rope is within comfortable reach. There is now hassle with all kinds of ropes since you may take in all (except the stern ropes) before casting off. Oh, how I loved it to start a day like this! I love doing the MOB maneuvers since I´ve learned how to perform the Figure-8. It´s fun to do it because there´s action, work at the winches and you have to be precise at both helming and assessing distances. Though I hope I´ll never be forced to apply my knowledge in real life rather than taking on board a fender again. When doing the Figure-8 I was able to rescue the buoy after 1 to 1.30 minutes. Pretty fast, isn´t it? But there´s even a faster maneuver. The Quickstop. Ready for the next MOB-Trial? Problem with Figure-8: There might be situations when this all-time classic isn´t the maneuver of first choice. Maybe there´s not enough room, you are alone and have nobody to work the sheets or if something (the weather?) forces you the react very, very quickly. Solution: The Quickstop will return the yacht to the spot of the MOB within a wink of an eye and without allowing too much distance to be put between you and the person in the water. A Quickstop should be performed when sailing close hauled. 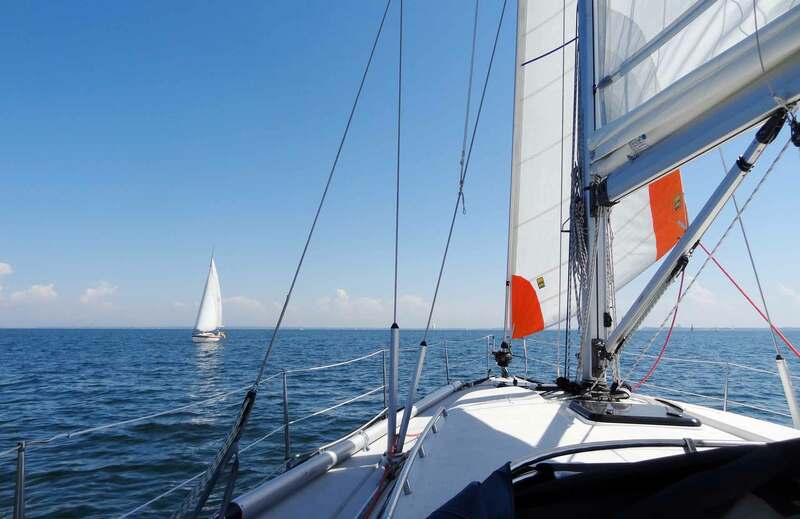 When the person is off the ship, try to haul the mainsail – and perform immediately a tack. Performing a full circle around the MOB, when one or two ship lengths passed the person, further circling to a gybe. Immediately let loose the jib-sheet, shortly thereafter the mainsheet. You should now have performed a full circle, have reduced speed to near zero and be positioned right next to the person to start the recovery efforts. Advantages: The Quickstop is a very fast maneuver requiring very little space. It can be performed with just one person on board and needs no big preparations (given that the boat is sailing close hauled). On the contrary to the beloved Figure-8 there´s no working at the winches needed. But it´s a maneuver suitably only when sailing close hauled or in a close to beam reach. If you ask me personally, I like the Quickstop but I will stick to the Figure-8. Why is that? Because I have more time to plan a precise run towards the MOB. With a Quickstop, there is no such time. I will have to know my boat very intimately to have it stopped right at the desired position. With a Figure-8 I will first put some distance between me and the person to have a perfect run into the wind to the rescue. I really didn´t like performing the Quickstop, I found it was too much of “music” and hectic associated with that maneuver. But that´s surely a question of practice. And here´s what I think too: With every single cruise you are going to cast off to, there should be at least one MOB-trial for everybody helming the ship. No matter if Figure-8, Quickstop or just simply MOB with engine is practiced. 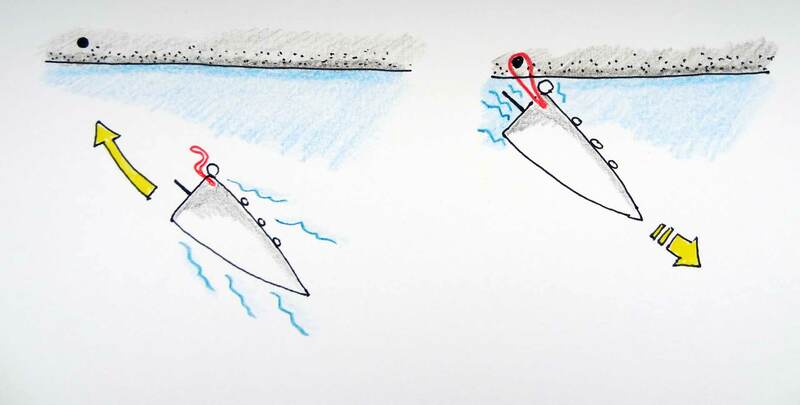 When two ships are meeting each other in open sea or on waterways, we do have collision prevention rules regulating how everybody ought to act accordingly. Who is the privileged vessel, who will have to change course – it´s a clear set of rules every good seaman should have knowledge of. But there are so many occasions when simply the give-way vessel won´t change course. If signaling won´t do the job, there´s one last thing to do when acting as privileged vessel: Avoid collision with the so-called last minute maneuver. Problem: “High noon” at the sea – big time panic! Especially in cramped waterways. As a skipper a ton of questions and decisions are battering upon our heads. Where to go? Port? Starboard? Luffing, veering off? Skippers can be made unable to cope at an instant. What the hell is this “last minute maneuver”? 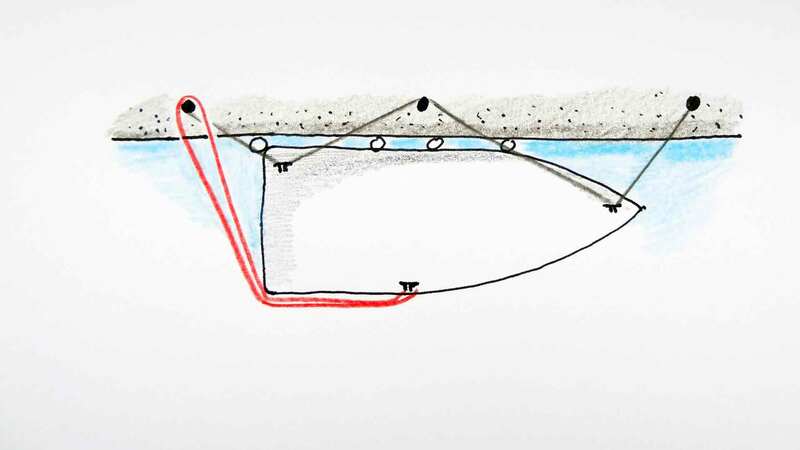 Solution: Well, it´s easy as ABC when sailing close hauled or in a close reach. We just need some speed. And a courageous helmsman. That´s basically all. The boat will perform a full circle, though with reduced speed. During the full circle the give-way vessel will hopefully steam past our collision course when we head back onto the initial course. That´s basically all. And yes: A sailing yacht perfectly can perform a full circle without any sheet-work. Advantages: This is so simple, I cannot find words. It does perfectly work when sailing close hauled or on a close reach. Yes, there´s some stress in the rigging but that´s far better than having your bow slammed into another vessel. 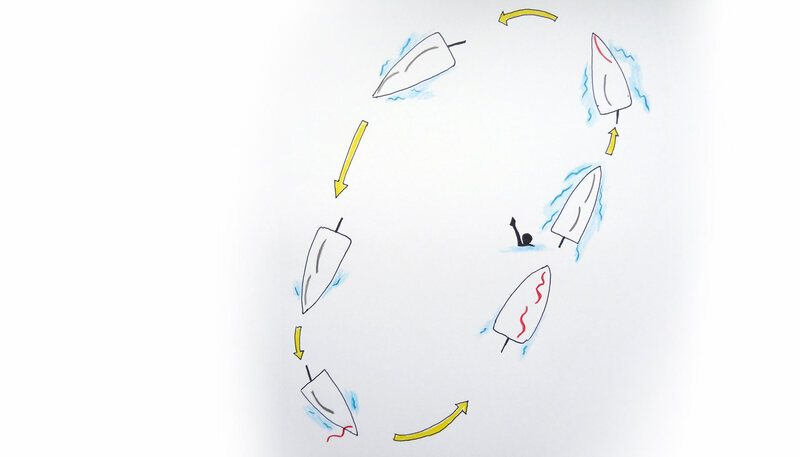 Even during the full circle you will be able to decide to stop circling, veer the sheets to have the yacht sailing at a different point of sail when going back to initial course isn´t desirable anymore. 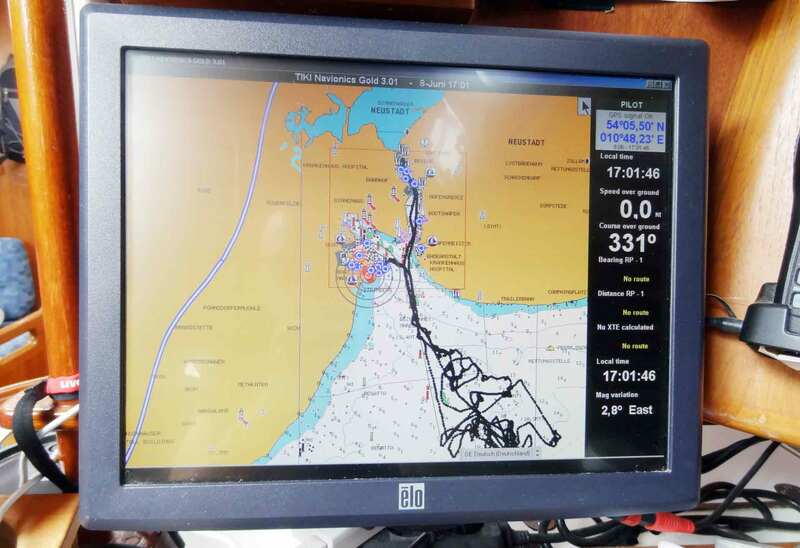 This is what I´ve learned during the 6 days onboard MERENNEITO of Well Sailing Hamburg. 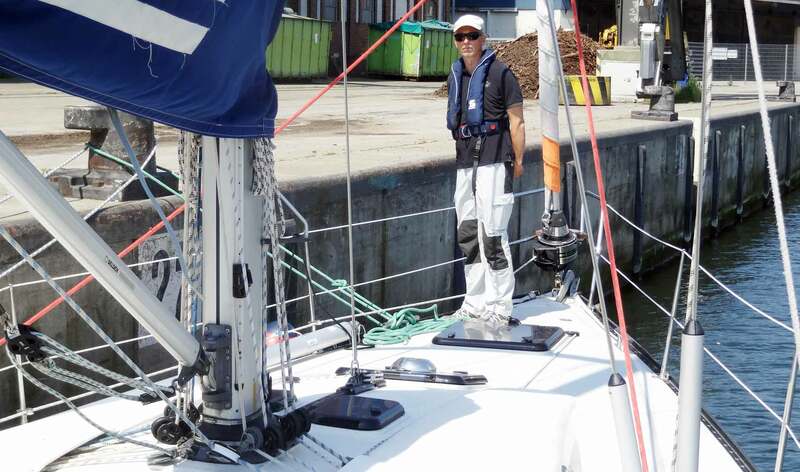 200 miles of perfect sailing with skipper Dietmar and Andrea. It´s a great feeling having passed the SKS-examination by having enjoyed the hard yet perfect drill of skipper Dietmar. He was pushing us, adding a new challenge every day and giving room for trying, being creative and seeking own solutions (even if his solutions proofed superior in the end). By teaching us how to land, cast off or do a MOB rather different as it may be taught by the book he achieved his goal: Putting a little bit of seamanship into us lubbers and besides, making us pass this exam and get the certification. I hope one or two of the shown maneuvers are of interest for you. Than You for a very good drawings and most informative article! I will definitely try those manouvers soon as we go sailing. Keep it coming, already waiting next blog. Firstly I would like to thank you for a very good and interesting website! I have a comment about the stern-first landing maneuver. That’s a very nice way to do it if it is calm or the wind is coming from shore, but if you have a strong wind blowing to shore it will be a bit more tricky as the bow will quickly turn around when the boat is slowing down. In that case it might be better to turn the boat around and keep the stern into the wind in order to have best possible control when approaching the pier.